The Surveillance Camera Players traveled to Peekskill, NY, on Saturday 23 October 1999, as planned and announced. For this (their very first) public appearance outside of New York City, the SCP performed two plays: Headline News and a brand-new work by Bill Brown entitled You Are Being Watched For Your Own Safety. On this occasion, the SCP consisted of Bill, Susan and Lorraine. Both of the group's performances in Peekskill were attended by legal observers from the Westchester Civil Liberties Union and by two uniformed cops from the Peekskill Police Department. A team from the local TV station Channel 12 taped the first performance and interviewed the SCP and several others. In addition to numerous passersby -- who were given explanatory flyers issued by both the SCP and by the group's hosts in Peekskill (who reprinted the article in the Associated Press as it appeared in The Boston Globe) -- both shows were attended by several local anti-surveillance camera activists (including Marilyn, who videotaped the performances and interviews with the SCP for airing on her show on local cable TV, and Valerie, whose statement on "The Color of Our Classist Justice" will be accessible here soon), and by a representative from the New York Libertarian Party (with which the SCP has already traded links from their respective websites). The group traveled to Peekskill, the hometown of New York State Governor George Pataki -- a place in which surveillance cameras have not yet been installed -- because of the strength of the year-long protests against the city government's plans to install them in at least two public locations: a workers' compensation office located in the Steinbeck Building on the corner of Main Street and N. Division, and Bohlman Tower, a federally-funded housing project for the poor on Main Street. (It was in fact at these two locations that the SCP performed: first at the Steinbeck, and then at Bohlman Tower.) Several Peekskillians -- some of them affiliated with the Station House, an alternative art and music space on North Division -- have been imprisoned for refusing for pay fines incurred for speaking at City Council meetings about a subject (surveillance cameras) that is not on the Council's agenda. Serious, public debate about surveillance cameras hasn't been "on the agenda" in Peekskill since September 1998! Though they have been contacted by anti-camera group from Toronto, with which the SCP will be acting in tandem come 24 December 1999, the SCP have longed to meet activists as committed as the Peekskillians to the anti-surveillance movement. Ironically, the imprisoned activists, despite having their First Amendment rights utterly violated, were unable to stir the local Civil Liberties Union into action on their behalf, at least until the SCP announced their intention to come to Peekskill. And so the trip to Peekskill forged a series of new links: between the NYC-based SCP and the Peekskillians; between the Peekskillians and the Civil Liberties Union lawyers; and between the Westchester Civil Liberties Union lawyers and the SCP. 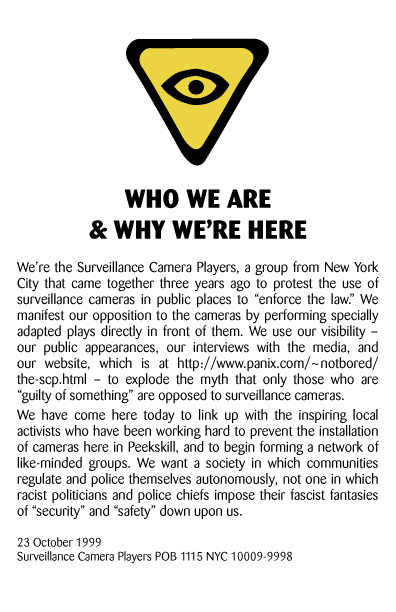 In this way, a state-wide anti-surveillance camera movement can be built. Let it be known that, when New York City Mayor Rudolph Giuliani officially declares his candidacy for the Republican nomination for Senate, the SCP will travel to another city in New York -- quite possibly Buffalo -- to both perform in front of surveillance cameras and announce a state-wide campaign against Giulianistic surveillance. But let us not get ahead of ourselves. There is much to explain -- not to mention much to do -- before the SCP goes state-wide. You Are Being Watched For Your Own Safety is Bill's second play written specifically for performance in front of surveillance cameras. (The first is Headline News.) Like its predecessor, You Are Being Watched For Your Own Safety isn't clearly divided into acts or scenes and doesn't call for any clearly identified roles or characters: it can be performed as a solo, or by up to seven people. In total, the play -- which takes approximately 30 seconds to perform -- consists of seven boards, each of which displays a hand-printed slogan and shows a surveillance camera. In order of appearance, the slogans are: YOU ARE BEING WATCHED FOR YOUR OWN SAFETY; WHO IS WATCHING? ; COPS WITH GUNS ARE WATCHING; WHO WATCHERS THE WATCHERS? ; COPS WILL SHOOT PICTURES LIKE COPS SHOOT GUNS; NO MORE RACIAL PROFILING; and NO MORE INVASIONS OF PRIVACY. The most significant board for the Peekskill performances was the one that says NO MORE RACIAL PROFILING, for it came out of discussions Bill had on 21 October 1999 with a black anti-camera Peekskill activist named Daryl while both of them were being interviewed live in a telephone interview with Lea Zeldin of WORT-FM (Madison, WI). Though racial profiling is commonly practiced by both New Jersey highway patrolmen and state troopers, and by the notorious New York City Special Crimes Squad, the SCP had not made any direct connection in their plays between surveillance cameras in New York City and racial profiling. Before contacting, talking at length with and learning from Daryl -- who helped make clear the necessity of speaking out against the racism of the Peekskill government's plans to install the cameras in areas in which only poor Blacks and Latinos live or need to go -- the SCP were less emphatic about the racial aspects of surveillance than they were about the socio-economic and political aspects. To express these developments and expansions in its thinking about "profiling" to include both racial and consumer profiling, the SCP added NO MORE RACIAL PROFILING to its list of basic demands. This new demand struck a chord, especially when You Are Being Watched For Your Own Safety was performed at Bohlman Tower. After the performance, and while the SCP and others were being interviewed by Marilyn, two residents of the Tower -- upon hearing that we (a group of white people) were against the installation of cameras in front of their homes -- were willing, even eager to speak on camera. One of these residents, a man named Preston, told us that his son was murdered by the police a year ago and near the very place at which the SCP performed. Heart-breaking as Preston's story was, it was a deep pleasure to meet him, for he made audible a thought in several minds, namely, that the SCP had broken "the rules" by coming to Bohlman, and that this "transgression" was the most radical -- the most productive -- aspect of the whole Peekskill trip. It should not go without mention that one of the legal observers was troubled by the board in Headline News that proclaims "Abolish private property." Surely we couldn't be serious?! But, alas, we are quite serious about the communal ownership of all "property" (in the legal and commercial senses of the word), even if it means putting well-intentioned but fundamentally conservative attorneys out of work.